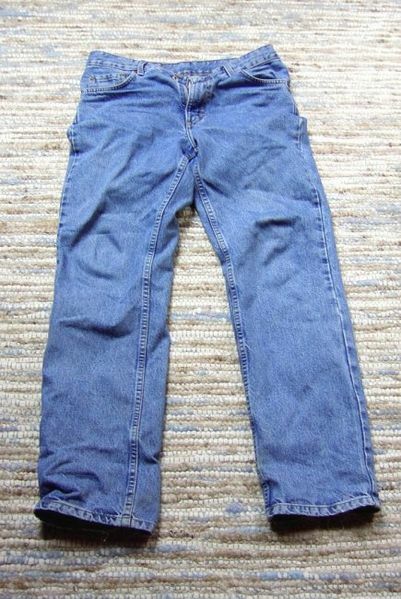 Jeans have become one of the most worn pieces of clothing in the world. Everybody wears them, from the rural farmer to the urban lawyer and from models to housewives. But why have jeans become so popular. You’ll get many answers. For some people they look cool, for others jeans are simply comfortable. Jeans were first designed as durable trousers for farm workers and miners in the states of the American west. A Nevada tailor, Jacob Davis, had the idea of using copper bolts at the corner of the pockets to make them stronger. They became popular instantly and soon many people bought them. Although Davis knew that he had a great product which many people wanted to buy, he didn’t have the money to patent it. He asked Levi Strauss, who supplied him with cloth, to help him out. The two worked together and started making jeans out of denim, which was more comfortable and could be easily stretched. It also became softer as it got older. They were dyed with indigo because it did not go through the cloth like other dyes do. At first jeans were worn only by workers, especially in factories. In the eastern part of the US jeans were hardly worn at all. They were associated with rural people and the working class. But when rich easterners went on holidays to escape everyday life they often put on jeans. James Dean and Marlon Brando made them popular in movies and everyone wanted to wear them. Jeans became a symbol of the youth rebellion during the 1950s and 1960s. College students started to wear them as a protest against the Vietnam War and the establishment. The new trousers were banned in American schools and sometimes in theatres and cinemas. As time went on jeans became more acceptable and today they are worn not only as casual clothes but also at formal events. Other countries quickly started to get accustomed to wearing jeans too. American servicemen on duty in Europe and Japan often wore them when they were not on duty to show that they were Americans. The trousers showed the world a happier way of life, something that people needed, especially after what they had endured in World War II. Jeans were also worn because they made people equal. You could afford them and they couldn’t be torn so easily. They had practical advantages as well. They didn’t need to be washed as often as other trousers and women didn’t need to iron them. This became more important as more and more women started working and had less time for housework. Today jeans are an essential part of our lives. They are almost always washed a few times before being sold to give them their faded appearance.